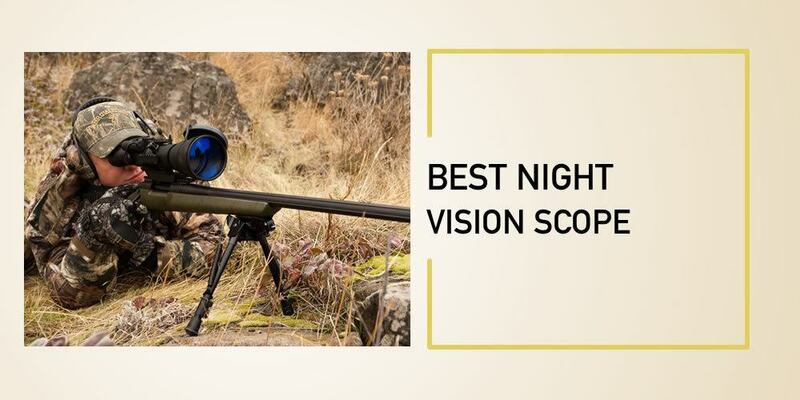 Best Night Vision Scope In 2019 - Top 6 Reliable Models Selected By Experts! Best Night Vision Scope In 2019 – Top 6 Reliable Models Selected By Experts! Night vision technology was first used by the German military in 1939. Today, there have been so improvements in this technology and night vision devices are not only used by law enforcers, military but also the civilians. Whether you are a hunter or a shooter, you need to have the best night vision scope. Night vision scopes are common among many hunters because they help them see at night although there is no color. If you want a quality device that will help you see details in low light conditions, then I'm glad you are in the right place. I have covered reviews of quality night vision scopes for hunters and shooters as well as a quick buying guide with some important tips that will help you select the right one. All the night vision optics I have covered here are made of durable materials, provide high-quality images and they have large detection range among other features. 6 Best Night Vision Scope : Comparisons! Finding a quality night vision scope can be tough especially if you are a beginner. However, with the right information, the whole buying process becomes easy. These are some of the top night vision scopes that you should think about buying. Finding a quality night vision scope with improved optics can be tough especially if you are a beginner. Whether you are buying it for hunting, target shooting or any other activity, ATN X-Sight II HD can be worth your investment. 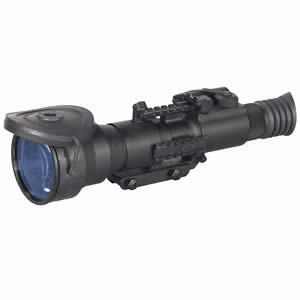 This is a quality scope that provides HD resolution for day and night use. You can expect crystal clear images whenever you are viewing your targets. The following are some of the features that make the scope great. This is one of the best scopes that you can use during the day and at night. It will offer you quality images regardless of the lighting condition, thanks to its smart HD optic technology. It has a magnification of 5-20 that offers you the right magnification all the time. As compared to other scopes, this one is designed with a built-in rangefinder. This simplifies your work because you don't have to carry other additional equipment to help you range the targets. The inbuilt rangefinder calculates the distance giving you the chance to make accurate shots all the time. This scope also gives you the chance to record quality HD videos. Its 1080p full HD resolution and the use of SD card help you record memorable experiences without using USB cables. This means that you can never miss any moment when you are out there. Hitting your target on the first attempt can be hard but with this scope, everything is easy and achievable. It is designed with a ballistic calculator so you don't need to think about reticles and charts. You only need to put the environmental data and all the calculations are done. This greatly helps you hit your target even on a first attempt. When you are selecting a night vision scope, it is important to consider the battery life. In his case, this scope offers you with 22 hours of continuous use. The battery is simple to charge and it is also capable of powering other devices. A night vision scope is an important device for shooters, hunters, surveillance activities, law enforcement among others. Shooting at night can hard because you cannot shoot an object that you can't see. We all know that night vision devices are heavier and bulkier as compared to convention day devices. One of the main benefits that you will enjoy when you have the Firefield rifle scope is a lightweight body. This makes it easy to handle without any issues. This is a scope that features quality craftsmanship so you don't have to worry about damages. It features durable titanium housing as well as a rugged design so it can withstand shocks from falls. It also features a flip-up lens cover that enhances its durability. As compared to other scopes in the same price range, this scope provides you with a decent and powerful magnification of 3x. This makes it a very useful device when it comes to long-range shooting. You can easily hit your targets without any problems or strain. 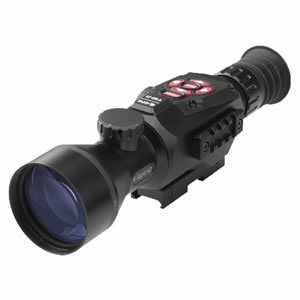 This is another great aspect that makes the scope usable at night because it enhances your vision. The built-in illuminator gives light that you need so that you can see things clearly at night. Apart from providing illumination, it also enhances your viewing range in the dark. You can therefore use this scope to see images of medium to long range targets. If you are an avid hunter, you definitely want to have this night vision scope. The optics of this scope are multi-coated to prevent unwanted light reflection. It is easy for you to view without any distractions that result from reflection. The multi-coated lenses offer more light which helps you see clearly. Human beings have great qualities but we lack the ability to see at night. This is why we have night vision devices that allow us to clear clearly even when it is dark. If you are thinking of buying a night vision scope for your rifle, the choices out there can be confusing. This is why I recommend the Armasight Vampire 3X Night Vision Rifle Scope. Everyone wants to spend their money on a quality scope that will handle the outdoor weather. This is one of the most durable scopes that you will find on the market today. It features a solid aluminum housing that protects the electrical components from recoil and harsh weather. 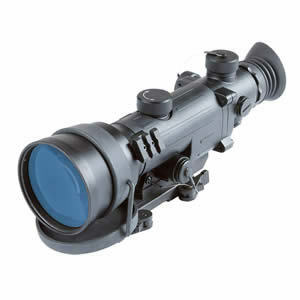 A good night vision scope should help you see your targets without any difficulty. To achieve this, the scope features a durable core with an XLR IR illuminator that provides effective lighting for clear vision in lowlight conditions. You can see your targets with ease and make accurate shots.The scope also features an illuminated reticle which has brightness adjustment to suit your needs. The Vampire scope is designed with multicoated glass lenses that provide more light to help you see the images clearly. It also has a fine reticle that is manually adjustable which makes it easy to achieve precise placement of shots. When you purchase this scope, you don't have to spend extra money on purchasing other items because everything is included in the package. It comes with batteries, user manual, carrying case and all the necessary mounting hardware. Not all night vision scopes are designed with easy mount accessories. The tactical rail makes it easy to mount additional accessories, illuminators or lasers. You will enjoy up to 40 hours of continuous use from the batteries before you recharge. Sometimes it can be hard to know when the battery is low if your scope doesn't have a low battery indicator. With this scope, you don't have to worry about that because its indicator will alert you when the battery is low so that you can change it. If you want to spend your money on a quality rifle scope that you can use during the day and at night, Sightmark SM18008 can be a great investment. This is a quality rifle scope with amazing features and it gets the job done perfectly. As compared to other night vision scopes, this one has a battery life that is 33% longer. The scope is also weatherproof and shockproof so you don’t have to worry about its durability. Here are some other things that make stand out among other models on the market this year. Most rifle scopes do not give you ample room for recoil. This is why this one offers a long eye relief to support recoil once to make shots. The distance between the eye and the scope lens is 60mm which is enough. The scope features 6 white, red and green reticles that you can select from to get an enhanced precision. 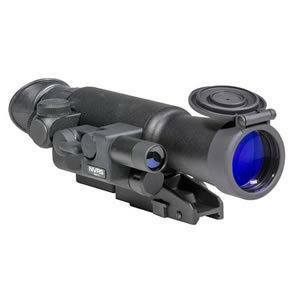 It has two duplex reticles which make it a perfect device for hunting hog and varmint. The two crossbow reticles are compatible with a wide range of crossbows like 320, 350 and 370fps. Human eyes are less capable of seeing at night as compared to animal eyes. To help you see clear images, the scope features a built-in LED IR illuminator. This means that you can see clear images even when there is total darkness. Targeting using this scope is pretty easy. It has a superb 640x480 resolution to enhance contrast as well as provide vivid images when you are viewing your targets. This increases your chances of hitting the target accurately. If you would love to capture your experiences, the video recording feature has got your back. You can record moments and your adventures during the day or at night so that you can share them with your family and friends. Are you a hunter looking for a night vision scope that will work well when the distance between you and the target is great? If this is your situation, I would recommend you to get the Armasight Nemesis6x-SD Gen 2+ Night Vision Rifle Scope. This scope has incredible aspects that will make your hunting and shooting experience the best. A good scope should not be hard to use. Even if you are a beginner, you will find it easy to use this rifle scope. It has simple control buttons for easy operation. The scope also features a top quality image intensifier and windage and elevation adjustments that are easy to use. The Armasight night vision scope gives you a powerful magnification of 6x. You will also enjoy a large 6.5 degrees field of view. When it comes to optics, it is designed with all glass IR transmission multicoated optics that are shock protected. This scope utilizes generation 2+ night vision technology that provides a wide range of benefits as compared to generation 1+. You will enjoy a longer range, great resolution, versatility, brighter and clear images, full field of view just to mention a few benefits. This is one of the best scopes that will ensure you achieve accurate targeting. 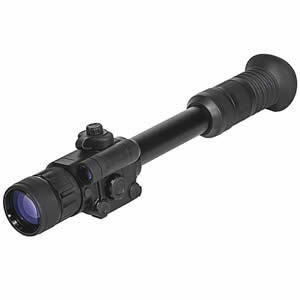 It is designed with thin crosshairs that are hard to find in other scopes on the market. The crosshairs in this scope are perfectly defined so you can aim and shoot at small targets that are away from you. When using it at night, the crosshairs are perfectly illuminated so that it is easy for you to aim at your targets without any problems. This is a nice feature that improves your vision at night. The main purpose of the detachable IR illuminator is to help you see objects that are far away at night. This IR illuminator emits invisible infrared rays to your target so you can see it with ease. This is another outstanding feature of this scope that helps you to use it with almost any weapon. A picatinny / weaver mount ensures that your scope is perfectly secured on the rifle and they will hold well even when the action is intense. Are you a tactical operator, law enforcement officer, hunter or engage in night time activities? If so, having a night vision scope can change your visibility at night and in low night conditions. If you need a great scope with a high magnification, look no further than the Night Optics D-760 Gen 3 NV 6x Scope.The scope offers a magnification of 6x and a large objective lens diameter of 165mm to offer quality images. It also comes in dual colors which include red and amber. Here are more features of this device. This is a Gen 2+ night vision scope with white phosphor image intensifier tubes that offer superb clarity as well as performance. This is a unique feature that you will not find in other traditional night vision scopes. It helps you see well without being exposed to bright light. When there is frequent bright light, the user might not get the best performance. This might force you to either turn off the lights or remove the night vision device. The multicoated optics of this scope allow you to see images clearly without unnecessary reflection. The optics allow more light so that you can see your images clearly. When you are buying a night vision scope, durability should come in your mind. You don't want to end up with a poor quality scope that will not last. 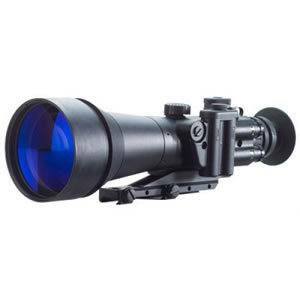 In this case, the scope features a durable rugged design to withstand outdoor use. The scope is designed with a quick release throw lever mount to offer you with a fast and easy installation. The scope mounts well on your rifle and it is well secured. The scope can operate for up to 60 hours when using only 2AA batteries. This is a longer time that will help you complete your activities before you change the batteries. Having a night vision scope will help you see clearly in low light and dark conditions. On top of that, it is equally important if you understand how night vision scopes work. So how does a night vision scope works? Understanding how night vision works is simple. The scope intensifies the light available to help the human eye see details. They have a thermal unit that detects the temperature difference between the target object and the surrounding environment. If you are using illuminating products, you must have light from starts, moon or other artificial sources. The products amplify the light making it possible for you to see when it is dark. If there is no light available, they can also use infrared light which is hard to detect. The funny thing about night vision scope is that they do not provide you with the real image. Instead, you will see an amplified electronic image. This is why you will see green images which help the human eye to see more shades as compared to other colors. Just like purchasing other optics, you need to put in mind some few considerations so that you can end up with a top-notch night vision device. Here are some tips that will help you. Weight and Size: If you make a quick comparison of night optics with day optics, you will note that night optic devices are larger and heavier. As a result, some shooters experience fatigue carrying the rifle and the scope from one point to the other for a longer period of time. You can look for a smaller and lighter optic to eliminate the trouble of weight. Check out to find out whether the scope rail in your rifle is large enough to hold the optic well. Magnification level: It is great if you buy a night vision scope with the right magnification. In as much as most people would prefer a high magnification, a lower magnification is better. This is because if the size of the image is increased, you can end up with blurred images. I would recommend scopes with a magnification of 3x or 4x and with an adjustment of around 9x. Field of view : The field of view in a scope refers to how wide you can see at the set distance. This distance is usually 100 yards in many optics. If you are a hunter, it is important to consider the field of view because you need a larger field of view to observe your targets with ease. Night and day use : This is another factor that you should consider. You can find some night vision scopes that also allow you to use them during the day. They give you the opportunity to switch them from day to night mode. In most cases, you will find that these scopes are heavier so if you are worried about weight, they might not be your number one selection. Clarity: Clarity refers to the resolution of a scope during low light conditions. If your scope cannot help you identify the targets when hunting at night, then the clarity is not great. Scope's resolution is measured in lines per millimeter and the higher it is, the more clear you will see your targets. Battery life: What type of battery does the scope have and how long is its life? You should have all the information about the battery and its expected life before you begin using night vision. I would advise you to look for a night vision optic that comes with a common battery. When you go to the field, you can carry two pairs of fully charged battery just in case your batteries get drained. Range: What range are you going to shoot at? You should know that night vision devices sacrifice the magnification for the field of view. Even with a magnification of 3x, you will get around 13 degrees field of view. In this case, it is pretty easy to lose your target even when it is 50 yards in low light condition. Budget: You should also consider your budget when you are buying a night vision device. As compared to other optics, night vision optics are expensive. For an entry-level night vision scope, you need to have a budget of around 500 bucks. You can also find some other models that cost up to 1000 bucks. Have a clear a well-defined budget when you are buying a night vision scope so that you can get a product that matches your budget. Q: How far can I see when I'm using night vision scope? A: There are different variables that can affect how far you will see. These include the object you are viewing, amount of light present, the scope generation and much more. Q: What are some of the ways in which I can use my night vision scope? A: Night vision scopes can be used for different purposes like hunting, camping, wildlife observation among others. Q: Are civilians allowed to own night vision scopes? A: Many years back, night vision devices were only used by the military and law enforcement agencies. Today they are available to civilians for purchase. Q: Are night vision scopes durable? What happens if I drop the scope? A: When it comes to night vision, you can probably break it if you drop it. These devices are delicate because they have internal parts with precision electronics that cannot handle any impact as a result of dropping. Night vision is one of the best technologies that have been invented. Today, there are great improvements in the night vision technology. Manufacturers are now providing affordable night vision devices with great features. The above night vision scopes are useful when it comes to hunting, shooting or surveillance in low light conditions. These are some of the quality night vision scopes that provide you with image brightness.